Admiral has been doing commendable work in digital recently. Its TV ads are some of the few that manage to successfully join TV advertising up with online, it’s Twitter account is a laudable example of social customer service and last week Admiral launched phase one of a responsive overhaul to Admiral.com. A redesign that notably puts it ahead of other insurance companies in terms of accessibility and user friendliness. So while high on the success of avoiding using the word admiral as an adjective in the opening four paragraphs of this article, let’s take a look at the new site and see where other insurance companies could learn a few lessons. David Moth investigated insurance companies and their checkouts last year and found the top five insurers on SERPs offer wildly variable experiences. Halifax’s website had tiny text fields and radio buttons, no date lookup tool, a tiny font and no neat UX features. Hiscox offers a similarly outdated experience. Allianz and Zurich have their faults, but offer far more accesibility. Legal and General has many areas where it makes obtaining a quote as easy as possible, but could certainly do with less cluttered forms. On the other end of the scale is Aviva, with its simple, clear, distraction-free and mobile friendly website. Responsive design seems to be a key differentiator here. 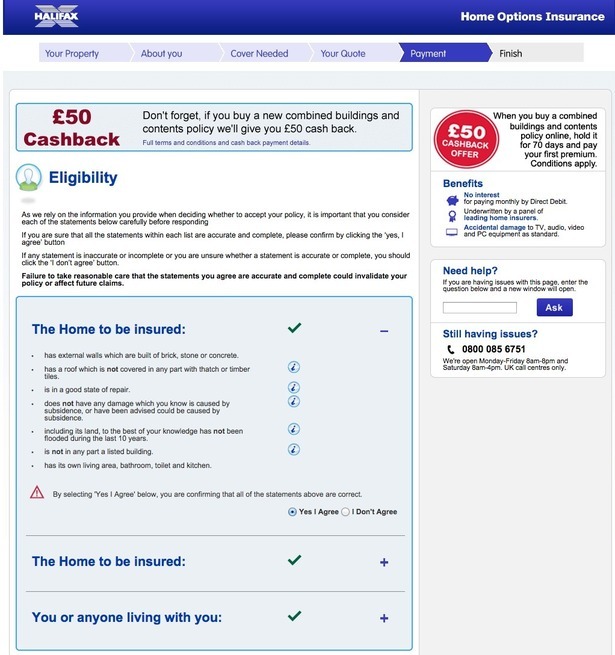 The insurers featured above offering a mobile optimised experience also have sites that put the user journey as its focus, making it a pleasure to fill in an online form. Which for an insurance company is an impressive task indeed. It’s very easy to annoy users when obtaining a quote, as our editor Graham Charlton discovered last month. Here are the most complained about problems with online insurance forms as identified by Whatusersdo. Let’s see how the new Admiral site copes with the above criteria. As Gareth Robinson, the head of ecommerce for Admiral has pointed out to us, the current incarnation is the first of three phases of its redevelopment. Not all of the site is responsive from day one, but the most visited pages of the site according to its data have been optimised. The first phase covers its key product landing pages (motor and home insurance) and customer help sections, so that’s what we’ll look at here. Admiral’s homepage is a work of concise focus. The purpose of this webpage with its central green CTA really couldn’t be clearer. Users who wish to use a more traditional method of contact haven’t been forgotten either. Especially when viewing the site on mobile, with its convenient click-to-call button. Back to the desktop, the navigation is presented boldly, with jus the core products offered. There’s very little ambiguity on where users can find what they need. More specific products are found in the drop-down menus and I especially like the subtle way the rest of the page darkens to help draw attention to the menu. Also note the large, readable text, which is something many online insurers falter with. Each product has its own specific landing page, which replicates the focus and simplicity of the homepage. This is particularly useful for insurance customers coming from search. The process for filling in the online form I’ll break down into numbered points, starting with property details. An obvious progress indicators, giving customers an idea of where they are on the process. If they can see the ‘finishing line’ it encourages then to keep going, and a five-step process is certainly an improvement on many forms I’ve seen in this industry. Easy to use address finder, which ignores the fact I didn’t put a space in the postcode. There is a constant message saying where to contact if you need additional help. My only criticism here is that perhaps Admiral could introduce a live chat tool. Live chat is becomingly increasingly popular for online users as it offer a convenient, real-time and free alternative. Overall I am impressed and heartened by the fact that page one of five in this journey just consists of a single question. Even more impressively, when I click through to the next page, all of the details of my address are already filled out for me. I just have to untick a single box before scrolling down to the large green ‘next’ CTA. Most of the likeliest details have been filled out for you based on UK averages. You are warned immediately when you input something wrong, or miss something out, which is preferable to telling you at the end. There are many hoverble help buttons, which clarify various details for you without cluttering the page. And thankfully all of the above features and easy to fill-in text entry fields work just as well on mobile. This is the longest form in the journey, some of the remaining steps just feature one or two questions. One of my favourite and unique user-friendly features is to be found on the security page. Images of locks, instead of text descriptions. Because how many people actually know the terms sash or mortice lock? I have genuinely never completed an insurance form so fast. I felt like I was guided through without distraction and with my convenience at the absolute forefront. This is a high benchmark for other online financial services to look up to, but one that is entirely achievable if the customer experience is the focus. For more on the insurance industry in the digital world, check out How insurance companies handle social customer service and How do customers search for home insurance? Fantastic news for retailers: the ecommerce marketplace is maturing and the cost of ecommerce platforms is generally declining. However the demand for services and solutions remains high, which means there’s an ever-growing appetite for new functionality to help businesses increase sales, improve customer engagement, reduce costs and extend their reach. Expansion into China is a challenge facing many brands at the moment. The size of the market coupled with a growing appetite for ecommerce and premium imports means it’s an opportunity that’s too big to ignore. Optimising PDFs for search is one of the most overlooked SEO opportunities available today. The good news is that it’s easy to optimise a pdf and, as well as helping your website gain traffic, it also improves usability.